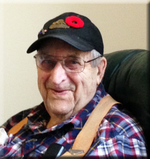 John passed away in Perth hospital on Sunday, September 2nd, 2018 in his 97th year. He was predeceased by his wife of 60 years, Lila (Oliver) McLean, his parents William John and Mary Elizabeth (Walker) McLean and brother Duart McLean. John will be sadly missed by his family Mary (Bob) Dore, Bill (Yasmin Aikman) McLean, Irene McLean, Nancy (Jim) Buchanan, Allan (Erin) McLean, nine grandchildren and eight great grandchildren. He will also be missed by his brother Robert (late Marilyn) McLean, sister Helen (late Fred) Day, sister-in-law Donna McLean, his extended family and friends. Friends may pay their respects at the Blair & Son Funeral Home, 15 Gore St., West, Perth on Wednesday, September 5th, 2018 from 2:00 to 4:00 and 6:00 to 8:00 P.M. Funeral service will be held in the Chapel on Thursday at 10:00 A.M. Interment Rideau Ferry Cemetery. John was a retired director of the Lanark Mutual Insurance Company and the Lanark County School Board. In remembrance of John, contributions to the Rideau Ferry Cemetery, Bethel United Church or the Canadian National Institute for the Blind would be appreciated.